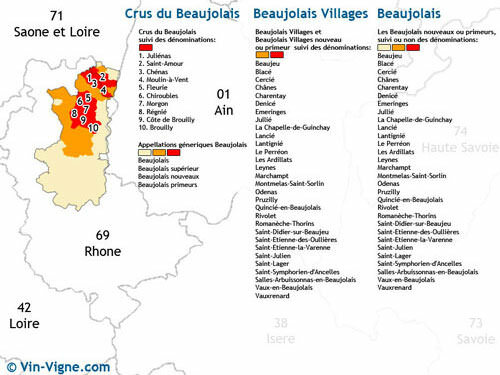 Where is the Beaujolais Vineyard ? The Beaujolais Vineyard is one of 16 great French vineyards. It spreads over 19,000 hectares along the river Saône and in the Auvergne-Rhône-Alpes and Bourgogne-Franche-Comté regions. Its altitude therefore ranges from 200m to 500m. This 55km long by 20km wide area includes communes of the departments of Saône-et-Loire and Rhône, from Chasselas and Macons to Lyon. The Beaujolais enjoys a variety of terroirs that include enclaves of clay, sand and silt. In the north the vines extract their nutrients from granite locally known as granite de Fleurie. In the central area, they grow on the limestone slopes (pierres dorées). In the south, they grow on schist in the Valley of Azergues. The Beaujolais Vineyard enjoys a temperate-continental climate. Winters are cold and last into spring; summers are hot because of the proximity of the Mediterranean. The region is swept by strong western winds that provoke a foehn effect. They indeed warm and dry up the air as they blow down the mountains of Massif Central. The rise in temperature counteracts the low temperatures associated with a continental climate. This is highly beneficial to the maturity process of the grapes. The Beaujolais Vineyard produces one million hectoliters of wine a year. Reds represent 95% of total production and are mainly produced with Gamay N, also known as goye. This grape variety is obtained from the crossing of pinot noir and gouais blanc. The Gamay N is a productive and robust variety, resistant to odium and Botrytis cinerea or noble rot. It produces high quality wines; whites are produced mainly from Chardonnay. Beaujolais, Beaujolais Villages, Brouilly, Chénas, Chiroubles, Côte de Brouilly, Fleurie, Juliénas, Morgon, Moulin-à-Vent, Régnié, Saint-Amour. It also has 2 IGP: Comtés Rhodaniens and Saône-et-Loire. The Beaujolais Nouveau is not an AOC. It is a primeur wine, exclusively produced in the AOC Beaujolais and Beaujolais-Villages areas. The Beaujolais Vineyard is one of the oldest in France. Indeed, it already existed when the Romans colonized France 2,000 years ago! 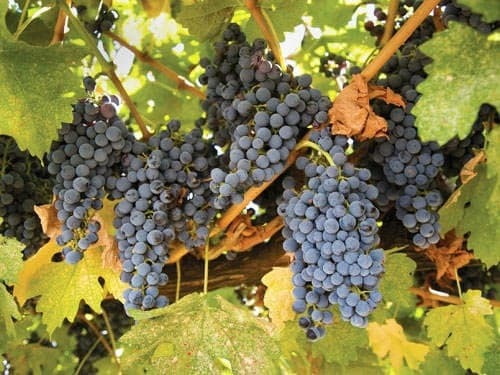 They named the local grape variety, Allobrogica, after the Gallic Allobroges who cultivated it on the slopes of the river Saône to the north of Lyon. Monasteries and abbeys developed the production of Beaujolais wines during the Middle Ages. Indeed, the prestigious Abbey of Cluny and Abbey of Belleville planted vineyards, respectively in Morgon and Brouilly. The abolition of the taxes in the Duchy of Bourgogne until the 17th century triggered the recognition and development of the Beaujolais Vineyard. Indeed Lyon wine merchants were suddenly able to export Beaujolais to Paris. The opening of the Canal de Briare in 1662, contributed to the development of the vineyard. It indeed provided a transportation link with the river Loire. However, the Beaujolais wines didn't benefit from the reputation of the Bordeaux wines. The vineyards of Brouilly, Fleurie and Chénas, in the north, already produced excellent wines. However, the wines produced in the south, near Lyon, were indeed considered low quality. Beaujolais wines were eventually recognized in the 18th century. The current Beaujolais Vineyard was already formed in the early 19th century. However, it was entirely wiped out by the spread of the caterpillar vine borer! The worse was to come in the late 19th century, when the odium, mildew and the phylloxera eradicated the entire French vineyard. Grafts, resistant to disease, were brought back from America in order to recreate it. Beaujolais wines were popular, however, the launch of the Beaujolais Nouveau in 1951 brought them fame. Indeed, this exceptional commercial success, initiated by the wine company Georges Duboeuf, did not only introduce Beaujolais Nouveau to the world, but also promoted the entire Beaujolais Vineyard! Beaujolais is administratively attached to the Bourgogne region. Resource and map Vin-Vigne - Please remember to drink responsibly www.drinkaware.co.uk – L’abus d’alcool est dangereux pour la santé, à consommer avec modération.